for the Monday Lunchtime Sketch Challenge #73. 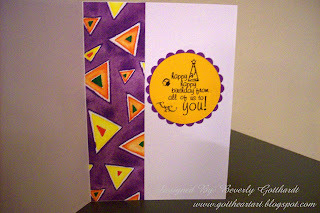 I couldn't get to the link that showed the sketch so I looked at a couple of the samples and pulled my idea from Mary Jo Price-Williams(the very talented young lady who keeps techno stamper going) card, thanks Mary Jo, loved your pink card. I've used these papers on some other cards I have posted and I like the paper so much that I'm trying to use as much as I can til I'm down to little bitty scraps. Let's see frugal, cheap, or going green? 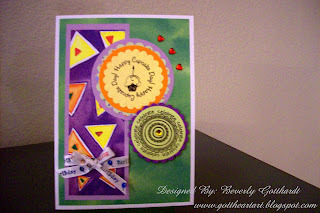 Supplies: Card Blank White 5" X 61/2"-Value Pack Hobby Lobby, Provo Craft Scrap Pad-Bright Kids, Birthday ribbon-Jo-Ann's, Coluzzule Circle, Spellbinders Nestabilities-S4 124 Classic Scallop Circle Lg., Ink: Ranger Archival Ink-Jet Black, Stamps: My Sentiments Exactly-Y590 Cupcake B-day, Stampabilities Clear Stamps #572289-CS074 Make A Wish, Hero Arts-adhesive Gemstones. What a great card! I love that the inside matches. Great job with the sketch, thanks so much for playing along.